What else says 'party' like zesty shrimp and vegetables? 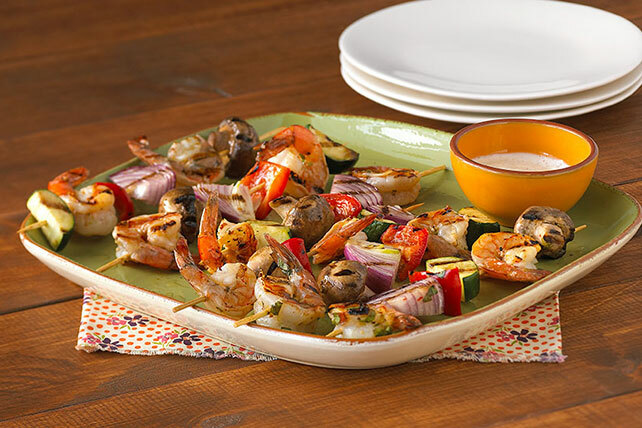 The marinade on these Zesty Shrimp and Vegetable Kabobs makes a splash poolside, or anywhere! Thread shrimp and vegetables onto 24 wooden skewers; place in shallow dish. Mix dressing, cilantro, 2 tsp. lime zest and 1/2 tsp. ground red pepper until blended. Pour over kabobs; turn to evenly coat kabobs. Refrigerate 1 hour to marinate. Heat greased grill to medium-high heat. Remove kabobs from marinade; discard marinade. Grill kabobs 6 to 8 min. or until shrimp turn pink, turning after 4 min. Meanwhile, mix mayo, garlic, lime juice, remaining zest and remaining ground red pepper. Serve kabobs with mayo mixture. Prepare using KRAFT Lite House Italian Dressing and KRAFT Light Mayo Reduced Fat Mayonnaise. Substitute 2 lb. boneless skinless chicken breasts, cut into 1-inch chunks, for the shrimp. Grill or broil 8 min. or until chicken is done and vegetables are crisp-tender. Soak skewers in water for 1 hour before using to prevent them from burning on the grill. For less heat, reduce the ground red pepper as desired. To broil the kabobs instead of grilling them, place the drained marinated kabobs on rack of broiler pan. Broil, 6 inches from heat, 8 min. or until shrimp turn pink, turning after 4 min.